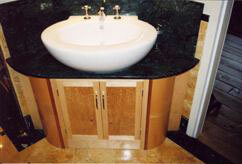 We design our bathrooms to be as individual as our customers. We believe that no two bathrooms are the same and we believe that a bathroom is no longer a room to simply wash in. Our bathrooms are designed so you can indulge and pamper yourself in luxury and relax in a room created and installed to the highest possible standards. With our contemporary fixtures and fittings you’ll feel a world away when you relax in your bath, whirlpool, shower or wet room. We design bathrooms not only to look the part, but also make you feel rejuvenated, refreshed and invigorated every time you use it.